In cult sci-fi tale Hitchhiker's Guide to the Galaxy, the most powerful computer in the universe was charged with finding the answer to life, the universe, and everything. In the real world, a newly built supercomputer that is the most powerful ever dedicated to science will be tackling questions about climate change, supernovas, and the structure of water. 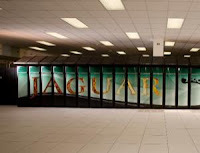 Jaguar has 181,000 processing cores, compared to the one or two found in most desktop machines. The world's only more powerful computer is the US Nuclear Security Administration's 1.7-petaflop Roadrunner at the Los Alamos National Laboratory in New Mexico.